An Elizabeth man has been sentenced to 30 years in state prison for repeatedly assaulting a livery driver and backing into him with his vehicle following an argument over a dinged car door in the parking lot of a local strip mall a year and a half ago, causing the injuries that ultimately resulted in his death, acting Union County Prosecutor Michael A. Monahan announced Friday. Emmanuel John, 33, must serve a minimum of 85 percent of the first 22 years of that term under New Jersey’s No Early Release Act before a consecutive 8-year sentence can begin, according to the conditions set down Friday by state Superior Court Judge William A. Daniel. At approximately 4 p.m. on Thursday, June 15, 2017, Elizabeth Police Department patrol units responded to the strip mall on U.S. Routes 1&9 North near Woodruff Lane in Elizabeth to find 45-year-old Masood Imran of the Avenel section of Woodbridge unconscious and suffering from a severe head injury, according to Union County Assistant Prosecutor Armando Suarez, who prosecuted the case. Imran was transported to University Hospital in Newark for emergency treatment, but never regained consciousness, Suarez said; he was pronounced dead at approximately 7:15 p.m. on Thursday, August 3, 2017. An investigation by the Elizabeth Police Department revealed that an argument between the defendant and victim over a dinged car door quickly escalated to violence, with John striking Imran numerous times through his livery cab’s open driver’s-side car door window, attempting to pull him out of the car, and striking him with the vehicle’s door. After being assaulted, Imran got out of his vehicle and went to take a photo of John’s rear license plate with his cell phone camera, at which time John abruptly backed his BMW sedan up, throwing Imran him to the ground. John then left the scene without checking on Imran or calling for medical assistance – two points he admitted when he took the stand during his two-week trial, which featured multiple video replays of the incident caught on surveillance camera footage. John was arrested within a matter of days of the incident and lodged in Union County Jail. Imran’s oldest son, 21, and oldest daughter, 18, both read statements into the record while Imran’s widow looked on during Friday’s sentencing hearing in Elizabeth, each saying that while the family forgave John for taking their father away from them, they still sought justice. 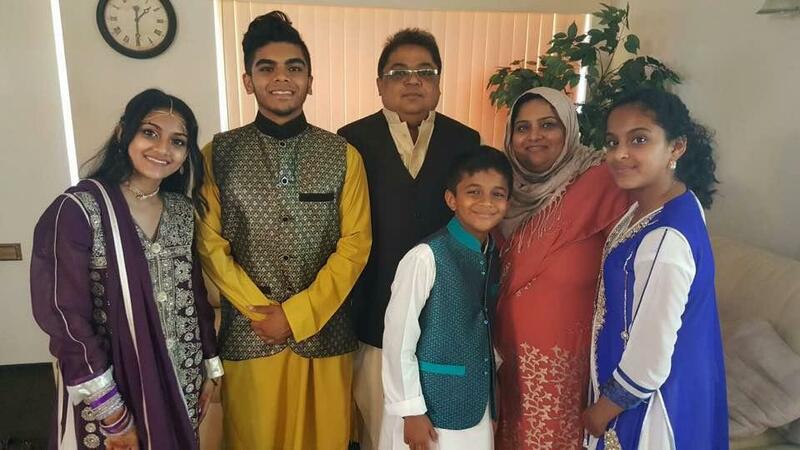 They described a loving, dedicated, and hardworking father of four who paid for his own parents to emigrate from Pakistan to the United States and also would work 12- and 13-hour shifts to support his family despite having to undergo dialysis treatments multiple times a week. “His happiness came from seeing me flourish and become the man I am today,” Ali Imran said. Judge Daniel found that three of five suggested aggravating factors and zero of four suggested mitigating factors applied in the case, wondering aloud “what it was that set him (John) off” when he remarked about the risk of re-offense. The trial in the case concluded in November 2018, when John was convicted of first-degree aggravated manslaughter, second-degree endangering the welfare of a child, and second-degree leaving the scene of a fatal accident following jury deliberations spread over two days. The endangering charge had been filed because John’s then-16-month-old son was in the back seat of his BMW when the incident took place.